We're still feeling bloated from over-indulging on the recent National Pizza Day, but before you know it now it's the snappily-titled National Love Your Pet Day. 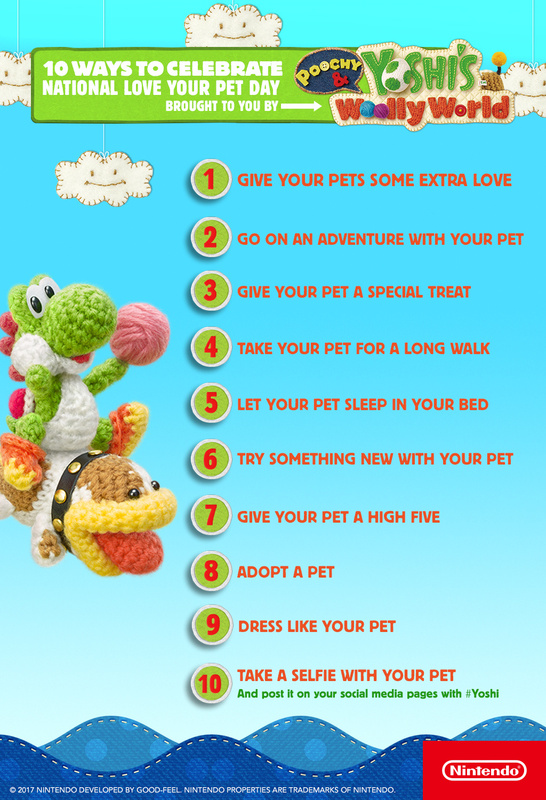 Our friends over at Nintendo of America have helpfully sent over a charming infographic with Poochy and Yoshi offering 10 tips about how to honor your adorable pets on this special day. While some might accuse Nintendo of jumping on a bandwagon in order to sell more games, let us remind you that Poochy & Yoshi's Woolly World is a worthwhile purchase for your 3DS. We really loved it in our recent review. Will you be posting a photo of your beloved pet with #Yoshi today? Got no pets, nor any kind of social media (unless you count Miiverse), so no pet pictures from me. My sister has a bunch of (adorable) cats though, and while I'm personally more of a dog person, I always give those cats plenty of love! ..I mean, when they want to, of course. Cats usually aren't too fond of receiving hugs. 11. Talk with language like your pets. 12. Marry with your pets. 13. Do some plastic surgery until looks like your pets. 14. Ask your pets to play Poochy & Yoshi Woolly's World together. 15. Eat together with your pets. 16. When you are sleeping, your dream is how fun to become an animal like your pets. 17. Speak like Yoshi if your pets is a dog. 19. Don't eat your pets. 20. Making a Stop Motion animation with your pets. If they do, they'll probably end up porting the Wii U version instead. It's all around more suited for Switch, rather than the portable edition, which will get held back by graphics, dual screen functionality, smaller game size, etc. Also, the hell's up with that profile pic? @iGen I agree wii u version is better for switch......my profile pic is from senran vs.
Every day is love your pet day. ...well. I tried to get my cat a wooly ball of yarn...but everyone is all out.. I wonder why?.. "Every day is love your pet day"
I totally agree! My cat is awesome! By the way: We Dutchmen have this same day on 4 October, called Dierendag (animal day). I just got Poochy and Yoshi's wooly world for 3ds, it is charming and looks really good on the New 3ds. I'm all for it, but which nation are we talking about? Aww this is just so sweet... to be honest I do many of these things for my pet cat anyways but this has encouraged me to keep at it more. ^_^ I love Yoshi and Poochy. So utterly adorable. @Miny_62 That is so sad Poor babies.